Let’s see, things used to be fine, but today you’re just not getting the same call volume as you were last year, the year before, or even five years ago. Things have been steadily declining for years without you being able to identify the cause or stop the losses. What can you do? Where did you go wrong? Don’t worry. We can explain. Your problem, if we’re guessing correctly, is ignoring the importance of your digital business while all of your focus has been on the physical world you interact with every day – the same one you’ve operated in since you opened your doors for business. Well, the truth is that it’s not the same world anymore and it hasn’t been for some time now. The rise of the web, and the ascendancy of mobile devices, means that most of your lead generation is done digitally today – even if you never realized it. No one can blame you for continuing to function as you always had. However, you have to adapt if you want to survive in this marketplace. THESE STEPS ARE MEANT TO BE EASILY TAKEN ON YOUR OWN – WITHOUT THE NEED FOR PROFESSIONAL ASSISTANCE. YOU CAN DO IT IF YOU TRY! But, if you’d like to discuss any of the listed steps, or any additional digital marketing services, our agency experts are standing by to schedule a free consultation covering your area of choice (773) 419-3636. From Google Ads to Web Design, Local SEO to Social Media Marketing, we can tackle any challenge you face. Plus, we don’t use long-term contracts, so you’re never locked into anything! Identify your unique selling proposition. Collect available video and imagery assets. Write effective content for website. Craft enticing calls-to-action for use. Create or claim major business listings. Build a directory profile for your business. Combine email contacts into a list. Get reviews from current and former customers. The very first step you should take, if you haven’t done so already, is to identify and clearly define your unique selling proposition. What separates you from your competitors? What’s the reason a customer would choose you over Plumber A or B? Getting a firm grasp on this can be a lifesaver when you start writing content for your website and advertisements. Not to mention you can’t expect to successfully sell your business if you can’t differentiate it from all the others in your space. The differences between your plumbing services and those of your competitors. Do you offer something they don’t in terms of services? The emotional need your service fulfills that others do not. Do you offer a satisfaction guarantee? A labor warranty? A free estimate? The singular benefits of working with you from the customer’s perspective. How is it to be a customer of yours compared to the rest? What makes the experience better? If you’re a plumber without a USP and need help identifying it, don’t worry. You’re not alone. We help plumbers across America handle this step and all the others in this list. You can check out our catalog of available services here. COLLECTING IMAGE AND VIDEO FILES WILL ALLOW YOU TO DELIVER THE MOST CONSISTENT PRESENTATION TO YOUR CUSTOMERS – WHEREVER THEY ARE! As a plumber, you have an ability to take imagery and video of work that most other verticals envy. You have endless choices for shots – from before vs. after to simple beauty shots of your accomplishments. Whatever the subject matter, you should be talking all the imagery you can when given the chance. It’ll pay off, we promise. Today, your digital visitors will appreciate imagery and video just as much as great content. This is because they’re most likely using a mobile device to check you out and, while they can do almost anything, they’re still not anyone’s preferred reading platform – especially if your site isn’t fast and mobile-friendly. Imagery and video can help you catch and keep their interest longer that dry text alone. And, it never hurts to show potential customers your stellar workmanship! Before & After: This works well on your website to give potential customers the visual proof they need to reinforce your stated expertise. You can also use a simple image editor to combine the two images into one with a simple text overlay explaining the work. It’s easier than it sounds! Glamour Shots: You’re a plumber and obviously have work you’ve done that stands out from the rest – be it a fantastic repair or an exceptional installation. Find the best shots you have and use them on your business listings. Persons of Interest: A good image of you and your team of plumbers is a must for your website and your business listings. This builds trust between you and the customer which is vital to an ongoing relationship. You’re coming into their home or business and should be recognizable to them if at all possible. Social, Social, Social: Social media channels were made for short video uploads and quality image sharing. They’re free to use with no limit to the amount of times you share, so be sure you use them to the fullest of your capability. In short, upload every day if you can! You could also consider drone video of your business location or trucks with identifying features. Drone shots do incredibly well with users as they give a non-traditional view of the ordinary. We can assist you with finding and using the right imagery and video for your website, your listings, and TV spots. It’s what we do! ENTER YOUR WEBSITE FOR FREE INSIGHTS. – SIGN UP! IT’S 100% FREE! SEARCH ENGINES LOVE INFORMATIVE, USER-FRIENDLY CONTENT. WHO KNOWS PLUMBING BETTER THAN A PLUMBING PROFESSIONAL? START WRITING! You’re a plumbing professional with all the knowledge about plumbing you’ve accumulated over the years stored neatly in your mind. It’s time to put those thoughts on paper, or a word processor, and share the benefit of your expertise with a wider audience! Your Website: This is the obvious place for your content to be uploaded and the one place it will do the most good. Don’t have a website? Our team can help you build one! Your Listing: There is no more important listing than the free Google My Business one every plumber should have. You can create Posts on your listing which give you free real estate on page one of Google’s search results! Your Social Media: These platforms are perfect for plumbers and give you unfettered access to your followers. Be sure you take full advantage of it by posting great content as often as you can. Be consistent and develop an audience! If you struggle with writing about yourself or your business, you’re not alone. Many plumbers do and it’s not a failing. In fact, it’s a benefit in some cases since you get to call on expert writers to deliver your message. 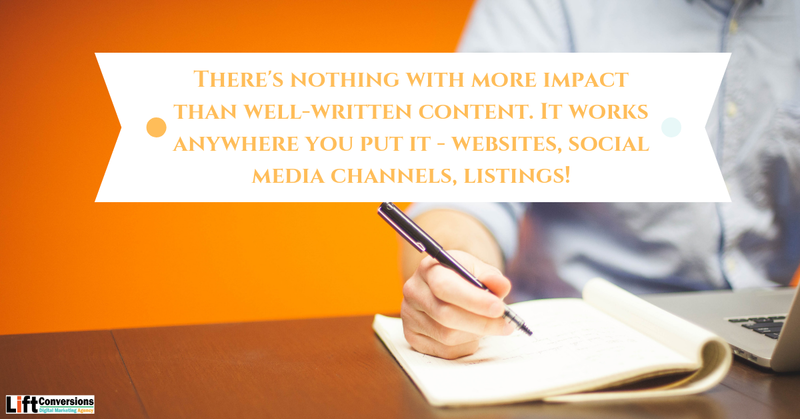 We can help you fulfill your content requirements fast! While this is content creation, it’s too important to not discuss separately from all the other content you create. Your calls-to-action (CTAs) are the enticements you will use to get attention and close the deal. They’re the taglines that set you apart and establish a presence in your potential customers’ minds. So, getting them right is a big part of winning in your market. Yes, call now is a CTA. However, it’s a lazy one. You can do better and you’ll need to in order to compete in today’s competitive landscape. Try to put yourself in the role of a customer. You’ve been one before, you know, so you should be able to get in that mindset. What did you want to hear? What words caught your interest? Include an action in your text. Use words with impact – like free. Have CTAs for every step in your funnel. Place them above-the-fold on your site! Finding the right combination is one of the biggest challenges faced by marketers and where a great deal of our monthly testing takes place. It’d surprise you to learn how much punctuation can affect interest. Be willing to test and test some more to always be improving your enticements. We can help you get it right! GOOGLE MY BUSINESS, APPLE MAPS, AND BING PLACES ARE POWERFUL TOOLS TO PROMOTE YOUR SERVICES – EVEN IF YOU DON’T HAVE A PHYSICAL LOCATION! Okay, we’re including this here even though we truly hope you’ve already done this. So many plumbers overlook the importance of map listings because they don’t see customers at their physical location. But, that’s missing most of the value found in these search engine listings – particularly the big three: Google, Bing, and Apple. Each of these engines is used to deliver information to users across your service area. Being in one or two isn’t good enough. You need to have a fully built-out listing, claimed and verified by you, on each of them to compete on equal footing. They’re basically additional real estate for you on the top of the search results pages, so why would you ignore them? Have your image and video assets available from Step #2 to give your listing all the vibrancy you can manage. Need help? We’re GYBO Instant Verifiers! WEB DIRECTORIES ARE THE MODERN VERSION OF THE PHONE BOOK. THEY’RE HOW SEARCH ENGINES FIND OUR ABOUT YOUR BUSINESS – PEOPLE, TOO! In the past, plumbers like you would only have to worry about one listing for their business – the phone book listing. The Yellow Pages were synonymous with locating the business you needed and that’s where people searched for information. Well, today the Yellow Pages have morphed into something similar, yet different. They’ve become online directory listings! While there are a great many directories to consider, we recommend focusing on those which have extended reach, or those with a direct relationship to your industry. For example, Angie’s List is an online directory. As a plumber, Angie’s List is important for your business. However, Expertise would not be as it’s focused on technology companies. Be sure you have your imagery and video assets available when you begin building out your listing profiles. They allow you to include your logo and imagery, website and video, plus your service list and more! We can help! OVER THE YEARS, YOUR PLUMBING BUSINESS HAS ACCUMULATED A GREAT MANY EMAIL ADDRESSES. COMBINE THEM INTO A MASTER MARKETING LIST! No matter how long you’ve been in business as a plumber, you’re certain to have communicated with a great many customers and potential customers. All of those contacts you emailed should be recorded in your email system for collecting and cataloging. You might just be surprised how many you’ve accumulated over the years. Go through your email, your phone, and your notebooks to find each and every email address you can. Gather them all together into a master email marketing list and you have a priceless resource you can use to get in touch with your past customers, your web visitors who’ve signed up for your newsletter, etc. Keeps you engaged with your customer base. Increases sales through promotions, coupons, etc. Improves overall brand awareness for your business. Lift Conversions specializes in email marketing campaigns and can assist you with content creation and automated email delivery. Learn more by reaching out to us at (773) 419-3636! CUSTOMERS CAN BE YOUR MOST EFFECTIVE SALESPEOPLE! TESTIMONIALS TURN POTENTIAL CUSTOMERS INTO SATISFIED ONES, SO ALWAYS ASK FOR A REVIEW! Second only to providing your customers with excellent service is requesting that they provide you with an honest review of their experience. Why? Because these testimonials are the most powerful advertisements you can have as a plumber. Doing excellent work is only half of the equation. You need the review to tell the world how well you did! While your customers can review you in a variety of places, you should put your focus in specific areas where you advertise before branching out. Listings play a significant role in your online reputation as a plumber, so filling them with good reviews is key to any winning strategy. If you’d like professional help with generating or mitigating reviews, Lift Conversions offers online reputation management fit for any size business! NO MATTER HOW TECHNOLOGICALLY ADVANCED YOUR PLUMBING COMPANY IS THERE SHOULD ALWAYS BE ROOM FOR GREAT SOFTWARE IN YOUR TOOLBOX! The plumbing industry, just like all industries, has undergone a great many changes with the introduction of technology and software applications specifically designed to make your life easier. From invoicing and accounting to scheduling and communication, there’s a software written for anything you need help with! As an agency focused on technology, and the best ways to use it to generate revenue, we’re ideally suited to assist you in selecting the right software for your plumbing company. Call (773) 419-3636. IF YOU NEED LEADS RIGHT AWAY THEN THERE’S NOTHING THAT COMPARES TO GOOGLE ADS! IT’S THE INSTANT GRATIFICATION YOU NEED TO STAY AHEAD! As a Google Partner agency, we may be biased in our opinion of Google Ads effectiveness in delivering the results you need as a plumber. It’s the fastest way to get your business listed at the top of page one of search results and, because you set your own bids, you only pay what you want! Google Ads has several versions to make it accessible for every kind of business owner – even plumbers without the time to run campaigns. You can use the version that’s right for you and get started in less than a day! You can follow this link to get started with Google Ads today! If you need assistance, we’re the right agency team to tackle your advertising challenges! Read more about our Google Ads services here. CONCLUSION: YOU CAN DO IT! WE’VE PROVIDED 10 STEPS TO START DIGITALLY MAREKTING YOUR PLUMBING COMPANY. NOW THERE’S NOTHING STOPPING YOU FROM GETTING STARTED! 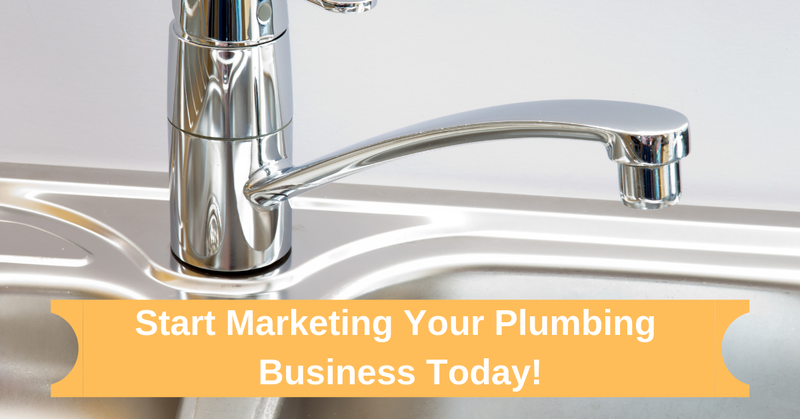 Don’t wait another minute to start marketing your plumbing business! Every second you wait puts you further and further behind, so do all you can now to stay in the game. Need help? We’re here to discuss any of your thoughts in our free consultation. Just give us a call today to start winning again (773) 419-3636!